The Damar & Hagen Stecksysteme GmbH is dedicated to Research an Development. This was recognized of the Federal Ministry of Education and Research. For further information to our values for customers, partners and employees please click here. 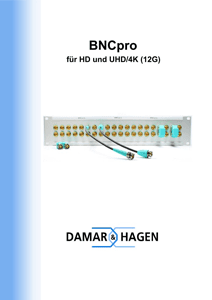 Informations to the BNCpro Cable Plug can be found in the following brochure: BNCpro Cable Plug Brochure For further information and the whole BNCpro product range, please click here !